Brutal Ashlander is a common Intelligence creature card. It is part of the Core Set. 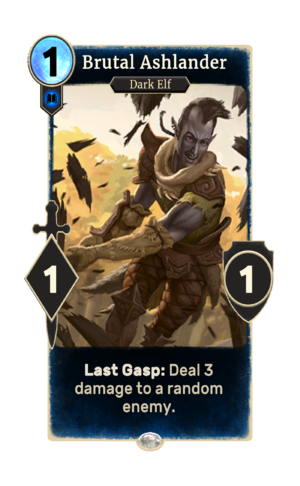 In addition to the card's availability in the Core Set, three copies are included in the Dunmer Avengers deck. "Your destruction is at hand." 'Enemies' include your opponent's creatures as well as your opponent's health. The card is named for the Ashlanders of Morrowind. This page was last modified on 14 February 2019, at 00:05.